TODAY IS THE FEAST DAY OF ST. JUSTIN MARTYR, a second-century Christian apologist. His Dialogue with Trypho (a probably-fictional Jewish character) gives us what seems to be, in a roundabout way, some interesting information on Jews and Judaism just after the Bar Kokhba Revolt. HAARETZ: Top 10 Israeli ancient mosaic discoveries: A fantastic ancient floor found in the Negev is just the latest in a series of discoveries throughout the country. PaleoJudaica has posted much coverage of ancient mosaics in Israel over the years. I have listed below all mosaic posts I could find in a reasonable amount of time, and I don't think I missed many. If there are links, follow them, often for much more information. JUST SO YOU KNOW: Adam McCollum has some examples of Melkite Syriac script. GOLEM WATCH: Strong fiction debut pairs immigrant Golem, Jinni (Joel Boyce, Winnipeg Free Press). New YORK, 1899. Another boatload of those teeming masses is about to arrive at Ellis Island, among them a solemn, statuesque woman from Danzig. Caught without a ticket, she leaps off the ship and sinks like a stone, only to walk out onto the banks of the Lower East Side, hours later and miles away. Golem, of course, cannot swim. Meanwhile, in Little Syria, a tinsmith is labouring over a dented antique oil lamp. Erasing a portion of the ancient script, he is nearly knocked out by the explosive release of an imprisoned desert spirit. Trapped in human form, the fiery being, whose true name can only be spoken by the wind, is equally surprised by where he's ended up. These are the opening chapters of American Helene Wecker's literary debut, and they're doozies. Perhaps the most famous beast of Jewish folklore is paired with a creature right out of The Arabian Nights. And they're re-imagined as developed, human-like characters. An earlier review and more golem links are here. Paradoxically it was the lure of Christianity’s sacred writings, which were exempt from the scribal conventions mentioned above, that first drew attention to the Qubbat al Khansa’s genizah. Damascus tradition had long asserted that the structure held guard of the Christian past and that the building was never to be opened except by order of the Sultan. In 1898 by appeal to latter, and in the presence of Kaiser Wilhelm the Second and the New Testament scholar Freiherr (Baron) Hermann von Soden [1852-1914], tradition was defied. Von Soden dreamt of another ancient book that could rival Codex Sinaiticus, both in its antiquity and completeness. Back in Germany he secured funding from a Fraulein E. Koenigs to review the Damascus documents with which he had only the most fleeting of acquaintance. On behalf of von Soden Dr. Bruno Violet was sent to Damascus in 1901. He was enlisted to enter the Qubbat al Khanza where he would explore its contents. Under its leaden dome the Qubbat al Khansa had stored a world of literature. The body of languages included Greek, Latin, Hebrew, Aramaic, Arabic, Coptic, Georgian, Armenian and Old French. The earliest texts were in Greek and were written between the 4th and 10th Century. Thereafter Arabic became the language of choice for local Christians as Violet’s analysis of Psalm 78, the bi-lingual Greek and Graeco-Arabic (Arabic in Greek script), was to show. Of the early manuscripts the Qubbat al Khansa could boast: three sheets from a 4th Century version of the Song of Songs, a 4th-5th Century fragment of Paul’s Letter to the Galatians, remnants of a 5th Century Book of Proverbs, a 5th Century scrap of Judith as well as a 6th Century portion of The Book of Esther. And if von Soden’s much sought-after codex did not materialise, the genizah did yield several leaves of a 7th and 8th Century parchment of the Gospel of Mark and Gospel of John. At the very least the genizah of Qubbat al Khansa can claim a rightful place within the field of Genizah Studies and should merit a reassessment (however difficult). The existing research is far-flung and disparate. With the exception of recent Italian scholarship, little attempt has been made to consolidate the breadth of the scholarly (secondary) literature. There is also the question of the manuscripts themselves: the status of the corpus is unknown. The National Museum of Damascus does retain several of the Islamic texts. But of the myriad of documents returned to Syria from Berlin in 1909, proof still awaits. Repartriation of antiquities can be a difficult judgment call, but in this case getting these manuscripts out of the Berlin Staatsbibliothek may have saved them from destruction during World War II. Or not. Who knows? In any case, with the current conflict in Syria one can only hope that they are still okay, that they won't be damaged or destroyed during the war, and that they can be recovered and studied someday. I'm not sure why "lower criticism" is taken to task in this article. Textual study and philology are what drives interest in such matters, and attention to "broader interests" tends to come only after the philologists have done the exacting work of reconstructing and deciphering the texts. If this geniza has been neglected, it may just be because there haven't been enough philologists to go around. But in any case, this new attention to the genizah of the Qubbat al Khansa is very welcome indeed and I hope it helps to generate interest in working what we still have of the collection and to tracking down the rest in due course. However, Giovanni Garbini, a leading expert on ancient Semitic languages and retired professor at Rome’s La Sapienza university, said the discovery doesn’t change much about what the world knows about Hebrew manuscripts. But Stephen Phann, acting president of the University of the Holy Land in Jerusalem and an expert in ancient Jewish manuscripts, said if accurately dated, the scroll is a rare and important find. “We don’t have anything much from that period,” Phann said. “It’s almost a friendship — that they have come to know the Torah scroll in their midst, and they draw their knowledge and focus on worship on how they live their daily life,” Phann said. ASKING THE IMPORTANT QUESTIONS: How do the Nephilim fit our theology today? "Living Nephilim-free - that's our challenge today." JUST GO WILD: Celebrating Slavic alphabet and culture. The ‘Slavic Bazaar’ festival to mark the day of Slavic writing and culture was held at the Russian Centre of Science and Culture (RCSC) on May 24. Organised jointly by the Institute of Russian Language and the Centre of Russian Language Teachers Training, the event was aimed at commemorating the 1150th anniversary of the Slavic alphabet. This is a very interesting story, but at the same time I am skeptical. Normally manuscripts of this age are dated by paleography (the shapes of the letters) and other factors such as orthography (spelling) and the physical layout of the manuscript. The article does not indicate what the range of possible dates are for the carbon dating: 850 years would at best be only an average figure. Moreover, an object such as a complete manuscript has often been moved around a lot and could have had ample opportunity to become contaminated. The script and physical features are mentioned, but they are the key factors and I want to know more about them. Nevertheless, unlike the story about this supposedly oldest copy of the Pentateuch, this one seems to have some merit. At minimum, it sounds as though a rather old complete Torah scroll has been newly identified, and this is a very good thing, whether or not it turns out to be the oldest one extant. And, of course, the issue is that it is a complete copy. 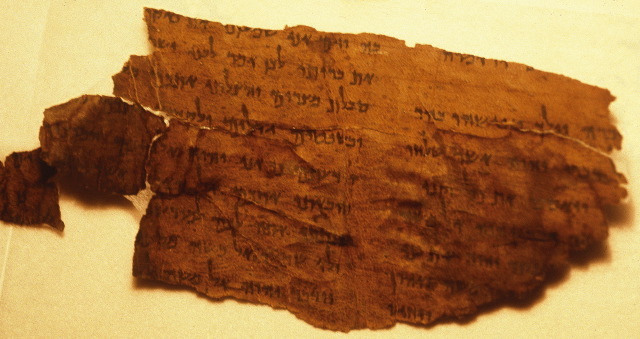 Fragments of the Pentateuch from the Cairo Geniza (see, e.g., here) are centuries older than this, and fragments from the Dead Sea Scrolls (see, e.g., here) are well over a millennium older. UPDATE: I should have also explicitly noted (as reader Robert Labanti emailed with the following two links to remind me) that this is a Torah scroll and that there are older codices (i.e., in bound book format) of the Torah, such as the famed Aleppo Codex (incomplete) and the Leningrad Codex (complete). Cf. Jared Calaway: Really Old Torah Scroll at University of Bologna. Also, Bart Ehrman quotes a press release that addresses some of my concerns: Exciting Discovery of a Hebrew Bible Scroll. It sounds as though the carbon dating was ancillary to the paleographic etc. analysis, which is as it should be. TUESDAY NIGHT IS TALMUD NIGHT IN WASHINGTON, D.C. Archaeologists expressed deep concern over construction and renovation works at the Western Wall enclosure in Jerusalem’s Old City, Maariv reported Tuesday. The work, they said, would greatly damage artifacts under the plaza floor, which would be lost forever. The Israel Antiquities Authority said in response that extensive preservation work was being conducted at the site. The ongoing project, which was given the green light in 2009, looks to build a new visitors’ center, expand the public restrooms and add an additional floor to the existing plaza. YESHIVA UNIVERSITY: Top Scholars Present their Work at YU’s Dead Sea Scrolls Conference. June 18th 2013: "Caves and Collections"
After our successful pioneering meeting last year, we are now pleased to invite you to join the second meeting of the Groningen – Leuven network of the Dead Sea Scrolls. This will take place on June 18th in Groningen, the Netherlands. These meetings are intended in the first place as informal gatherings. Our main aim is to foster scholarly collaboration, and to discuss recent developments in the field. The meetings are intended for both experienced and beginning scholars, but we also welcome graduate students working on the Scrolls or related literature. Not so long ago 4-terabyte-per-second computing speeds were science fiction. This project is extraordinarily important and (as the first video linked below notes) could advance the field of Cairo Geniza studies by a generation in a matter of weeks. Fragments from collections all over the world can be compared (mainly by handwriting and fragment shape) and sorted preliminarily into individual manuscripts. Two other articles have brief videos about the project: Arutz Sheva: High-Tech Solution to Judaism's 'Mystery of the Century'; Your Jewish News: Computer system to reconstruct 100,000 ancient Jewish documents found in Egypt. Much more on the Cario Geniza here, here, here, here and links. More on this particular digitization project is here and links. And for other manuscript digitization projects, go here and follow the many links. Reviewlet of Bloom, The Roman-Judaeo War of 66-74 A.D. THE STRATEGY PAGE has a brief review by A. A. Nofi of The Roman-Judaeo War of 66-74 A.D.: A Military Analysis, by James Bloom. TEMPLE MOUNT WATCH: Kudos to the Washington Post for correcting two errors in an article that involved the ancient Jewish Temples. Naturally, I want to nuance what they say even further, but they're doing pretty well here. I pick on the media a lot when they get it wrong, so it's only fair to note instances in which they are trying hard to get it right. HAPPY (BELATED) DAY OF SLAVONIC ALPHABET (24 May). This is a special anniversary, the 1150th, which merits this commemorative postage stamp. If you missed the festivities, you can celebrate again on 5 July with the Roman Catholic tradition. KANDO the younger, that is, son of the original Kando. Daniel Estrin has published the following AP article: Dead Sea Scroll fragments to hit the auction block: Palestinian family that sold scholars the biblical finds now marketing leftover fragments that were kept in a vault. Some background links: on the Kandos and their family business: here and here; on the Schøyen collection: here and here and links; on on the Scroll fragments acquired by Azusa Pacific University here and links; on the Scroll fragments acquired by the Southwestern Baptist Theological Seminary: here and links; on the Green Collection here and links; and on Hanan Eshel and that Leviticus scroll fragment here and links. UPDATE: Related, includes a useful list of collections of Dead Sea Scrolls: The Dead Sea Scrolls at a glance (AP). THE LOD MOASIC IS NOW ON DISPLAY IN PARIS: From a Lod garbage dump to the Louvre: Spectacular 1,700-year-old mosaic floor is first Israeli item loaned to the French museum (Aaron Kalman, Times of Israel).